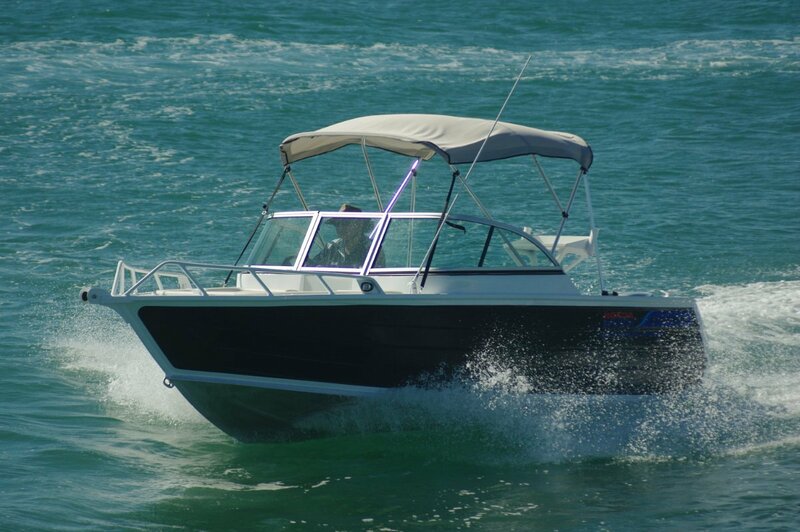 One of the most striking features of the Searano 500 is its price: $29,950 for a painted and pretty well equipped five metre bow rider. Learning that its birthplace was China could cause a sucking in of the lips of a few people, but this one does not give the impression of being constructed by a steel welder as have some of that country’s products. In fact the factory is run by Australian shipwrights, and the boat could easily be taken for Australian built. The bow rider layout strongly favours the rear cockpit. The bow compartment – reached via a door and opening windscreen – would be a bit snug with two adults in it but could cope with three juniors. Any juniors would immediately claim it anyway, and a good thing too: the driver can keep an eye on them without constant head swivelling. Under the seats of course is useful stowage, and the whole thing can be converted into a platform; even into a day bed. Bow rails give those options some security. The rear cockpit is naturally larger, made apparently larger still by its freedom from clutter. The rear lounge is removable, freeing up more space and giving access to a very good bait tray with proper drainage arrangements. Also to a 30 litre bait tank. What eats into the space a little is the motor being pod rather than transom mounted. This does, however, provide two good boarding platforms, one fitted with a ladder. Driver and offsider have simple swivel seats, adjustable for height and surprisingly comfortable. The ergonomics are surprisingly good, a little adjusting of the seat putting everything to hand. Electronics are the basic Honda monitors plus a VHF radio. Underfoot is a chequer plate aluminium deck. This is something out of the bag: the standard for this class of boat is plywood. OK, metal is hard on bare feet, but indoor-outdoor carpet or even a pair of thongs will fix that, and you have here an up-market deck. 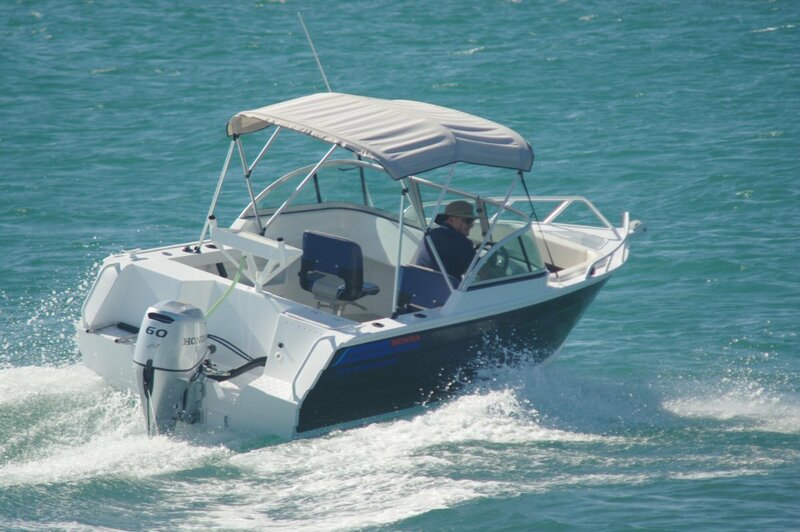 Bow riders are not optimal fishing boats but make good all round family boats, and this one has useful fishing features. Beside the bait tank and bait board you get the unusual extra of a powered deck wash, which is also a fish cleaning assist. Four rod holders in the coamings are joined by more in the bait board. A well braced canopy gives good shade from the windscreen aft. Full throttle into the breeze proved the effectiveness of the bracing: barely a shiver. Sea conditions did not offer the hull a lot of challenge, but that same full throttle gave no suggestion of anything but a good ride. The 60hp Honda fitted is only two thirds of the recommended maximum yet should get a family load moving well. With two medium weight adults aboard the power was better than abundant. A welcome extra, unusual in an economy priced boat, was hydraulic steering. Possibly a sign of advancing old age, a love of hydraulics is also due to respect for its resistance to wear and for its ease in operations like rounding up on pots and manoeuvring alongside. 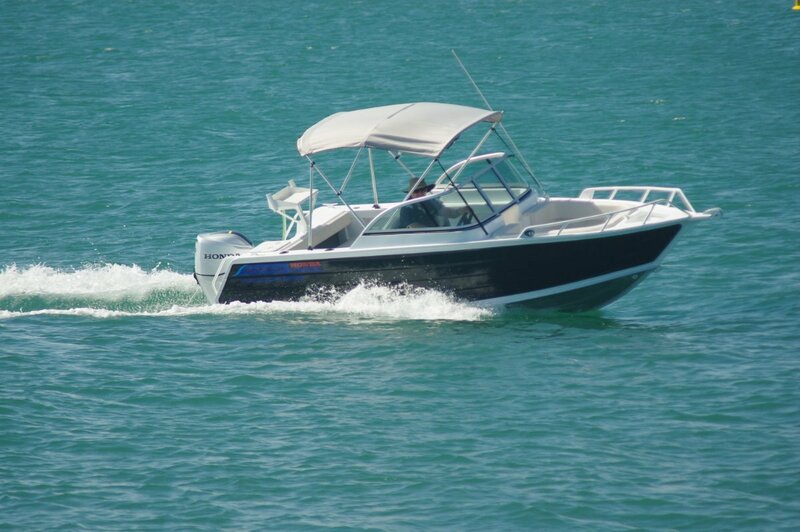 Outboard reliability has come a long way – far enough that the Honda has a seven year warranty. Fuel consumption has come down a long way from the old rule of thumb of a gallon per hour per 10 horsepower. The 550’s 70 litre tank should last a busy weekend. Imported boats from countries with different boating habits from ours sometimes come up short in the fit out; anchoring arrangements for instance. The 550 is rigged like a proper Australian boat: cleats at each corner, a bowsprit and an anchor well. This is a lot of boat for the asking price.